The Five Questions Series is a forum for scholars, government officials, civil society leaders, and foreign policy practitioners to provide timely analysis of new developments related to the advancement of women and girls worldwide. This interview is with Meighan Stone, president of the Malala Fund, highlighting new challenges to universal access to quality education. 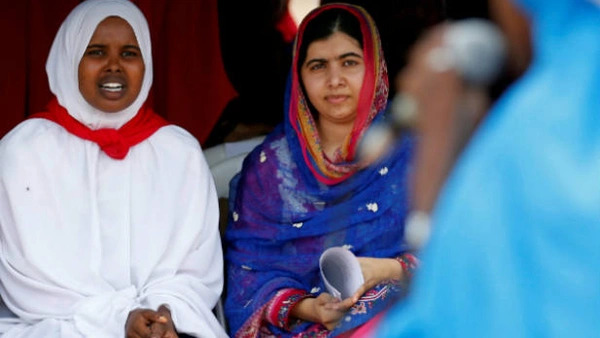 July 12th was Malala Day, the UN-named day to mark the birthday of Nobel Peace Prize laureate Malala Yousafzai, who spends the day each year campaigning for girls’ education. This week, Yousafzai visited the world’s largest refugee camp, a site in Dadaab that hosts displaced Somalians. Under the Millennium Development Goals (MDGs), the world saw significant gains in universal access to primary school education. Can you speak about the persistent gaps in girls’ access to secondary education, and why working with local partners to support adolescent girls is so critical? One of the great lessons we saw with the Millennium Development Goals is that when we set an ambitious goal, when we set the bar high, the world actually can develop the right policies, increase funding, and work with developing country leaders and donors bilaterally and multilaterally, to achieve that goal. The tremendous gains in terms of children attending and completing primary school under the MDGs is an instructive example. The challenge is that the MDGs stopped short at the equivalent of grade six. And for any of us, especially as women, thinking what our life would look like if we had finished our education at the age of twelve and the school gate had then been closed to us, and our only options were child labor or child marriage or simply a life of always knowing in our quietest moments that we hadn’t achieved our full potential. It’s devastating. It’s long overdue that the global community set a higher ambition for education, especially as we look towards the 2030 agenda for sustainable development. Education that is free, quality, and safe is the unfinished business of education around the world, particularly for girls. It’s important that it’s a modern, relevant education that prepares young women to be in the workforce. It’s also important that it prepare them to advocate for themselves, and hopefully to ultimately change laws and practices in their countries and communities that keep women from fully participating in family life, community life, and in government. To ensure twelve years of education, we must commit to it and also guarantee it. The SDGs set an ambitious target of a full course of secondary education. But from what we’ve been tracking at the indicator level, we’ve yet to see the simple number twelve—twelve years of quality education—put into those indicators. The young women around the world in classrooms and in refugee camps have high ambitions for themselves. It’s only fair that world leaders have high ambitions to match theirs. At the World Humanitarian Summit in May, the Education Cannot Wait fund was launched to help bridge the $8.5 billion annual funding gap for the millions of children living in conflict and disaster. Can you describe how conflict and disaster disrupt children’s access to education? Over twenty-four million children are out of school in thirty-five conflict-affected countries today, and every year that they miss school is a lost opportunity for themselves, their families, and their countries. We hear a lot about the “lost generation” of young people whose education is disrupted by conflict or other emergency. But these young people are not lost. They’re actually right in front of us. If policymakers decided to put resources in place, we absolutely could ensure that these children, especially girls, reach their full potential and don’t pay the price of conflict. Often the largest barrier to a girl in conflict getting an education is funding: lack of funding for schools and for teachers. Of course there are also policy barriers, for example those that keep Syrian teachers from teaching in border countries due to lack of certifications or work permissions, even though they would be well-placed to be teachers to displaced young women. There are some policy challenges we can overcome working collaboratively, and that was part of the focus of the World Humanitarian Summit. But for any partner providing education on the ground in a conflict setting, the primary barrier is funding. Can you share examples or lessons learned from the Malala Fund’s work with displaced Syrian girls in Jordan, Lebanon, and Turkey, in particular? What are some of the challenges that host governments face in providing quality education? Child marriage is one thing that any of us who have spent time in refugee camps with Syrian refugee families see constantly. I was in Istanbul for the World Humanitarian Summit in May and decided to stay an extra day to visit Syrian girls and their families. Displaced families live in parts of Istanbul where there are twenty people to one room without sanitation. If you ask the young women in the house to bring you any book to read, there will be no book. And you’ll sit with a 14-year-old girl who will tell you that she’s forgotten how to write anything in Arabic other than her name. And, in many cases, if that young woman is fourteen or fifteen, she is married. Most of these young women were coming from a good school system in Syria, and had access to safe, quality education prior to the conflict. As we look to the posturing and concern in Europe over the migrant and refugee crisis, and then we look to the border states, it is clear that Jordan, Lebanon, and Turkey have overwhelmingly had to deal with the most serious demands. In Lebanon, refugees make up 25 percent of the population. Turkey is housing more Syrian refugees than any other country. In Turkey, thousands of young refugees who speak only Arabic are entering a school system in which a young person needs to be able to learn and pass an exam in Turkish. Many certifications do not transfer. And in many host communities, for example in Jordan, some local children already faced challenges in accessing twelve years of quality education. Refugee children stress an already strained system—these are tremendous challenges. How can governments and the donor community more strategically invest in education in emergencies? Half the refugees across the world are children, so this is an issue that the donor community and governments around the world must address. I think the dividing line that we saw previously in our sector, where there was sustainable development on one side and humanitarian or refugee response on the other, is not as clear anymore. There is growing recognition that some of the gains seen in international development in education are being lost because of a failure to respond in a timely way and with the appropriate resources, partnerships, and cooperation on refugee education. So this is a strategic area to invest in. Another piece of this issue is that governments around the world simply need to make good on existing commitments to invest in education. It is an imperative. Coming out of the Syria summit in February, only about 25 percent of the pledged funding came through. The world is in the midst of a humanitarian crisis—if a government pledges funds, they absolutely need to then be distributed and received. As seen in the film He Named Her Malala, Malala’s father has been a remarkable advocate for his daughter’s right to an education. How can other fathers, brothers, and husbands, become champions of girls’ education, especially in traditional societies? At Malala Fund, we all follow the example of and take inspiration from the work of Malala and her father. For far too long people have looked at traditional societies, whether in Southeast Asia or the Middle East, and said that men are “non-traditional allies” in this fight for women’s empowerment and girls’ education. But what we see in Malala’s own family—through the example of her father, Ziauddin, an educator and activist in his own right—is that this is not the case. Our organization firmly believes, that there are more potential allies than conventional wisdom assumes. When you spend time in-country with men, especially young men, there are far more who are persuadable, who are willing to start to think about women differently, than may seem immediately apparent. We should apply the learning from change in our own country to our assumptions in other nations. In the United States, it was not that long ago that there was great resistance to women in the workforce, women in universities. We’ve seen tremendous change in just a generation or two. We firmly and passionately believe this can be the case in many other countries. There are teachers, activists, advocates, lawmakers, leaders, women and men, girls and boys, who believe in girls’ education and want to fight for it. They want to create change in their country and they see the value in educating girls to drive that change. That’s the reason why the Malala Fund’s primary way of working in-country is with local partners: we want to bring resources, capacity building, and partnerships to the very people who are changing their own countries. Today, overwhelmingly, the majority of international development aid or humanitarian aid is channeled away from locally-led organizations: only 2 percent of humanitarian aid goes to locally-led groups. That has to change.